Cardamom powder recipe with video, how to make elachi powder. 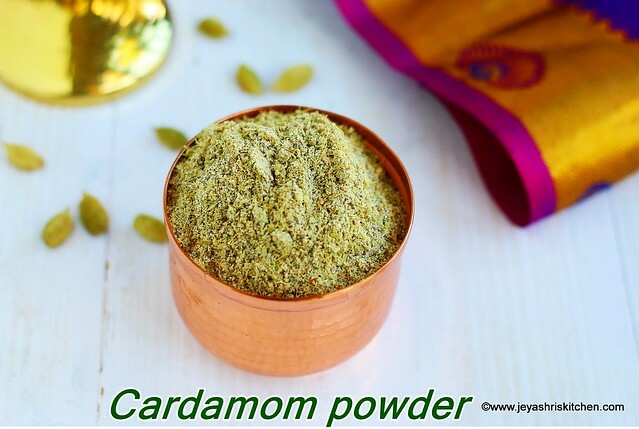 Cardamom powder, elakkai powder recipe using whole green cardamoms. My mom used to make cardamom powder and home and keep it in the refrigerator, which always is handy while making payasam, kheers and even for tea. Many years she was grinding cardamom along with little sugar and store it. Later she started doing this with raw rice and it gives nice volume to the cardamom powder. I have heated the cardamom in a pan as i don't get direct sunlight like how we get in the terrace or balcony. If you have access to terrace keep the cardamom and rice for 2 hours and then grind into a fine powder. Else you can microwave this for a minute and then cool and grind into a powder. If you have kept the cardamoms in the fridge or freezer, take them out and bring it to the room temperature and then proceed. 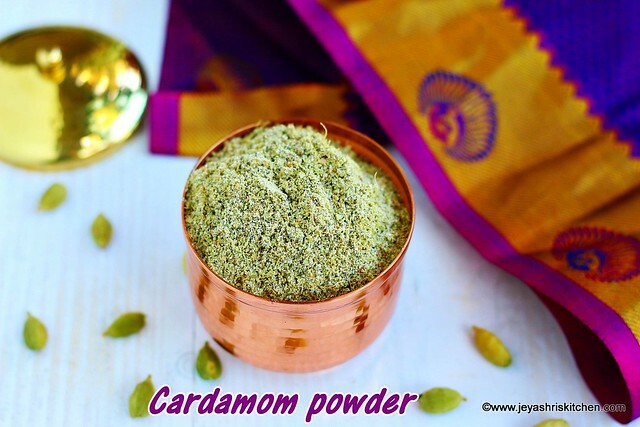 Description: Cardamom powder, elakkai powder recipe using whole green cardamoms. Heat a pan nicely and when it is hot, add the whole cardamom. Dry roast it for a minute. Add in the raw rice and switch off the flame. Let this stay in the pan heat for some time. Grind this into a fine powder in a dry mixer jar. Heat the pan nicely and add the cardamom, no need to roast for a long time. Cardamom powder stays good if kept in an airtight box and kept in the refrigerator. 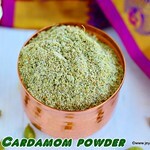 Cardamom powder can be added in Indian sweets, tea, biryanis and gravies. skin to be peeled off by hand before heating for making the powder?